Peter De Lane: Hello C2's, just back from the off license. 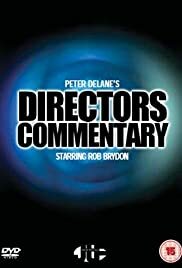 In a spoof of the common DVD commentaries, `acclaimed' director of television shows during the seventies talks us through some of his work. With a look at the camera work of his director of photography and stories aplenty, De Lane reminisces about the wonderful days past. When I heard the idea behind this I immediately wanted to see it; I'm sure the pitch to the production company went the same way. While the idea sounds good, it doesn't manage to be good enough to justify it's existence. It would probably have worked better as a series of sketches of 3 or 4 minutes each (a character in the Fast Show for example) rather than a 30 minute programme in it's own right. It would have worked if the writing had been really good, but it isn't. The dialogue brings out the inanity of the commentary really well, but the downside of this is that the programme itself comes out more inane than it does funny. It has the odd good line that reveals more about the bitterness of De Lane but most of the good gags are just repeated until they lose their effect. Certainly fans of Brydon's `Marion & Geoff' will be disappointed to discover that the writing here is about as far removed from that wonderful work as is possible. Brydon himself tries hard and does a good job of showing how pompous he is but again the writing really is what lets him down. Overall this is a good idea but this series simply doesn't manage to deliver it. Hopefully someone else will try this same idea in a sketch format and make it sharper and fuller of character. As it is, this series is rather too slow, with too few laughs and almost totally lacking in the sort of character that Brydon was blessed with in his recent work.